Zimpro Wet Air Oxidation (WAO) systems are used primarily for treatment of high strength industrial wastewater streams. Wet air oxidation (WAO) is the oxidation of soluble or suspended components in water using oxygen as the oxidizing agent. When air is used as the source of oxygen the process is referred to as wet air oxidation (WAO). The oxidation reactions occur at temperatures of 150º C to 320º C (275º F to 608º F) and pressures from 10 to 220 barg (150 to 3200 psig). The wet air oxidation (WAO) process can pretreat difficult wastewater streams, making them amenable for discharge to a conventional biological treatment plant for polishing. 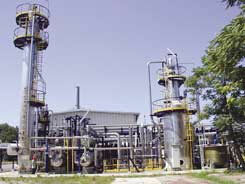 The process is also used for oxidation of contaminants in production liquors for recycle/reuse. biological sludge conditioning and destruction. Wet air oxidation (WAO) has historically been used for municipal wastewater sludge applications. At lower temperatures and pressures, sludge is conditioned to improve dewatering. This is referred to as Low Pressure Oxidation (LPO). At higher temperatures and pressures, biological sludge can be destroyed, as an alternative to incineration.